Hey there, welcome to the day one of the May Neat and Tangled release. The next stamp set up is called Paint Night and it's filled with cute icons to color! To create this card I used a combination of bright Copic markers to give the stamped images a beautiful wash of color. These were so easy to create! 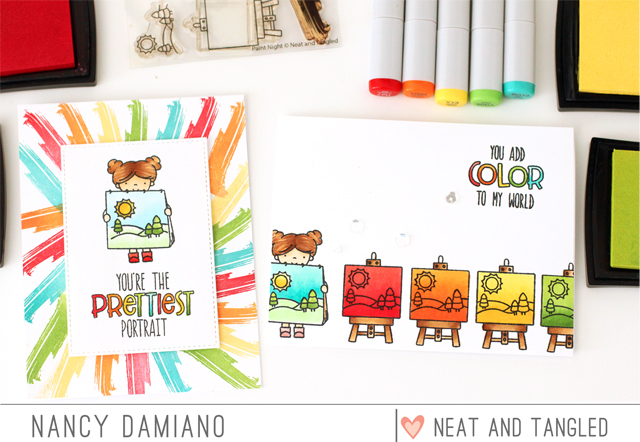 Neat and Tangled will be giving away a Paint Night stamp set. To enter, leave a comment below to be entered. Be sure to visit the Neat and Tangled blog on Friday for a list of winners. Good luck and thanks for stopping by! what an awesome idea! i love the different color canvas! Wow! Love these gorgeous colors!!! Both these cards are so cheerful!!! So lovely! Adore how you did the little canvas in different colors; almost Andy Warhol-ish. I love the bright and cheery colors. an adorable card! Cute, cute cards. I love this paper and glue thing too!!! Fantastic cards! Bright, happy and oh so fun. Charming cards with the Paint Night set! I love the touch of color in your cards, there are so pretties! These are adorable, and so bright and FUN!! Such bright and happy cards! I love them both! Love your bright and cheery cards. Thanks for sharing. Love the different colors on the paintings. I like your cute and colorful card designs. Fabulous creations!! Love all the color!! Adorable card!! I love the design you chose!!! Your designs are so cheerful and fun. Love it so much. So cute! I love the brush stroke background; it's so colorful. Both of your cards are outstanding! That’s a fun and cheerful combo of cards !